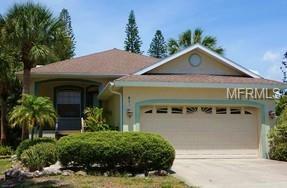 Siesta Key, single-family home located on Palm Island, a short walk from Siesta Beach and close to the village. The home is 2 bedroom/2 bath, plus office! Large living room and master bedroom overlooking a lagoon, spacious kitchen with new fridge, screen porch, deck, and 2-car garage. Interior features include fireplace, 10-foot ceilings, bamboo and tile floors, and French doors over looking deck and lagoon.The home was built in 1999, contains 1,445 square feet and is elevated to meet flood zone requirements. Survey and elevation certificate are available. Mature landscaping surrounds the home for added privacy.